Thanks to Peter Etelej, a blogger at The Online Kenyan I did this speed test. That was after a tweet from him appreciating the speeds increase. I have been using Safaricom Internet for a while now, being a smartphone user you need those good speeds to appreciate the true value of the gadgets you have. Plus the mobility it gives. Safaricom unlimited internet has been of late a very reliable resource for the mobile office and smartphone users, maybe due to the healthy competition, or just innovation from them. I was amazed to find that speeds had gone to as good as 900 kbps down and 800 up. Thats inpressive considering the same offering had been launched on a 256 threshold, then went to 512. I bet Safaricom is looking towards getting embraced as a fulltime option for home and mobile broadband, and with the numbers they have, it wouldnt take long to reap from satisfied customers. To be honest their internet was better last year. This year it’s just plain garbage with intermittent disconnections and down-times. They’ve probably throttled it in some areas. It was okay once and then now it’s just a major nuisance. Welcome, looks like I was absent from the timeline for the whole time till I saw your tweet. I havent tried unlimited Orange internet which was launched on 64kbps then upped to 256, would you mind doing a speedtest? I stopped using orange unlimited when i moved to westlands near Safaricom House! Either Safaricom booster were to strong for the orange internet or orange has a poor signal! So I understand why guys around campus have been fussing around about safaricom internet. I guess this is their damage control againt the orange daily unlimited at 39/-. Imagine just adding some 50/- onto safaricom’s 200/- daily unlimited you get orange weekly unlimited (IOM)! It is true! The speed is still the same. @597e44730f793fe9d7f27555b3007608:disqus Doesn’t this say some thing else? I just screenshot this. Mine is still at 512, and it is not because of my location, this is because when I am NOT on the unlimited data plan, I can experience not more than 3.5mbps (On the Huawei E160. The specs say that the device can do 3.6mbps), but the moment that I subscribe to the unlimited, the speed gets throttled to around 512. There are special occasions when, the high speeds are retained after I subscribe to the unlimited, but this does not last long, it soon kicks back to 512. If it is is true, would someone pls show the tweet that announced it? I am currently subscribed to the unlimited, and I was under the impression that maybe my current subscription would have to expire before I can experience the new speeds. 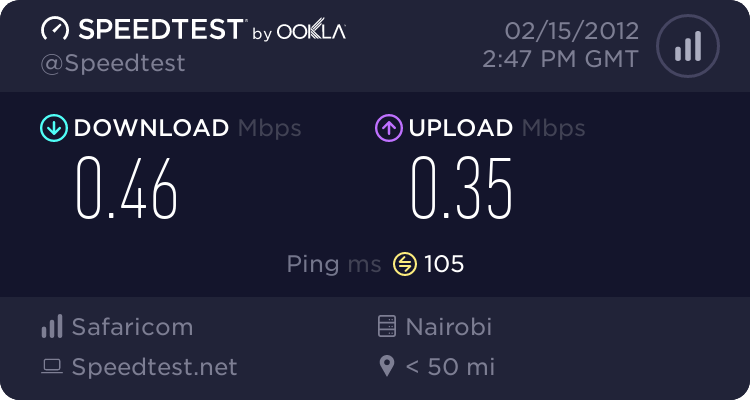 @37a304dea4e439a964af1cd09ee77e57:disqus After writing this article I went looking for that tweet in vain, later Eric up here asked Safaricom on their twitter handle about it but they said the speeds are still 512. I dont know how to explain it, but clearly I am getting the above-mentioned speeds on my Galaxy Note which is on weekly unlimited.